Responds to rain and snow and can also detect fog, depending on the adjusted sensitivity. A switchable PTC heater prevents ice and condensation. 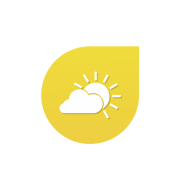 Save yourself an expensive weather station - with our unique online service you get accurate weather data from professional weather provider directly to your Miniserver!